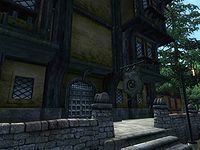 The Three Sisters' Inn is the more "upmarket" of the two inns in Leyawiin, located in the Chapel District of the town. It is found next to Margarte's House and the house for sale. The three sisters Shamada, Shomara, and Shuravi run the inn together but only Shuravi will offer services. She buys food and potions while selling only the latter. This inn is more expensive than the other inn in town; however, it is more than worth the extra cost considering the better comfort it offers. The ground floor is very large and consists of an entrance hall in the middle, the reception area with a bar, a dining room to right, and the rooms of Shamada and Shomara on the left. The guest rooms can be found upstairs. The room you can rent is in the east wing of the second floor. It is spacious and well-lit and actually consists of two rooms: a large antechamber containing a table with food, a desk, and a couple of bookshelves and a bedroom with an upper-class double bed. The west wing, which is locked, contains two identical rooms with double beds which you can sleep in. The third floor is Shuravi's private quarters. Like the second floor, it also consists of two sections. The east wing, which is locked, contains a dining and a working table as well as an owned double bed. The west wing consists of an antechamber for storage and a second room with an owned double and a table with food. There is a bug that occurs when you rent a room from Shuravi. Though you must still have the correct amount of gold, none will actually be subtracted from your total if you accept the room. You are then free to sleep in the bed. Esta página foi modificada pela última vez à(s) 17h16min de 9 de agosto de 2013.